Satay is standard street fare in Thailand. Usually a very simple recipe. My version for pork is a little more complex in flavor - a wonderfully different grilled pork recipe that is sure to please. 3 to 5 pounds boneless pork loin cut into strips or cubes around 1 inch thick. 3 cloves Garlic, finely minced or pressed. Soak thick bamboo skewers in water for an hour or more. Lace strips or cubes of pork on skewers and lay them out in a glass baking dish or two. Combine all marinade ingredients and pour over pork. 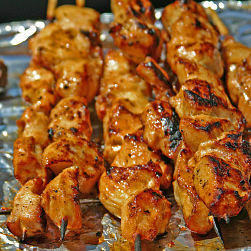 Turn skewers to make sure it is all covered with the marinade. Cover and refrigerate from 2 to 6 hours. Take out of refrigerator 1/2 hour to an hour before grilling to allow the pork to warm slightly before grilling. Not to room temperature, but long enough to take the hard chill off. Drain pork, reserve marinade. Grill over high heat, on an uncovered grill. 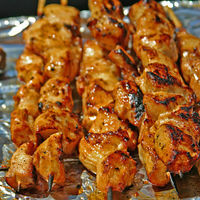 Rotate skewers 90° every 3 minutes, basting once with the marinade before turning the basted side toward the flame. To avoid contaminating meat with the raw pork juice in the marinade, thin the marinade with a little water and heat it to a boil in a saucepan for a few minutes, stirring continually to avoid burning. Make certain that you have a hot fire and DO NOT baste during the last 5 minutes of cooking time. The corners of the cubes of pork should appear quite brown. Cut into some of the thicker cubes of pork to make certain they are cooked. Because of the peanut butter in the marinade, the pork may look a bit dull after cooking. If serving on a platter at the table or on a buffet, I will squeeze a little lime juice over the platter and brush on a touch of Olive Oil to add a bit of a shine. To kick things up a notch, try serving with my “Panang Peanut Curry Combo Sauce” on the side for dipping, or for pouring over both rice and kabab. Sriracha is a Thai hot sauce, not a Vietnamese hot sauce. It may be manufactured in other countries under license, but the name is Thai and the origin is Thailand. It’s pronounced see-rachaa in Thai. David, Thank you for the clarification. Also, thank you for being the first to leave a comment on Haikuman.com. Ryan absolutely loved this at the International dinner, he will be thrilled that you posted the recipe.